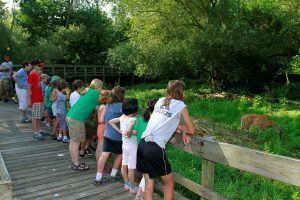 The Marketing Coordinator will support the organization’s overall efforts to raise awareness of the Nature Center at Shaker Lakes (NCSL) as one of the region’s top destinations and community resources that enriches people’s lives through environmental and conservation education, innovative programs, and community involvement. In particular, s/he will provide critical support to NCSL’s overall marketing and strategic communications efforts and focus on building and maintaining NCSL’s online presence, including social media maintenance, e-newsletters, website updates, as well as coordinating the development of collateral for distribution to support camps, classes, hikes, facility rentals, gift shop, special events, and other programs as needed. This person will help cultivate the public image and ‘brand’ of the Nature Center, which will ultimately result in helping the organization achieve membership, fundraising, and program attendance goals. ï Ensure integrity and consistency of NCSL’s visual identity and mission-driven brand is maintained to showcase the NCSL as a high quality and desirable regional attraction with unique and innovative programming that cannot be found elsewhere. ï Assist in managing the design process, through a third party designer, of promotional materials and collateral such as program flyers, invitations, brochures, quarterly newsletters, rack cards, signage, membership and annual fund appeals, and postcards for display, print and online use. Ensure incorporation of NCSL style guide and best design practices into all online and print collateral, including emails and internal communications (signage, nametags, etc.). ï Compile, edit and distribute high-quality content for NCSL’s e-newsletter produced monthly through Constant Contact. Manage editorial process. ï Photograph workshops, events and activities throughout the Nature Center for use in marketing collateral, especially social media, as needed. ï Update weekly and monthly calendar events in local and online listings alone or with help of intern or volunteers. ï Prepare in-house collateral and printed materials as needed (e.g. event signage and flyers) as well as content for digital donor wall. Research competitive landscape by identifying and evaluating competitors, offerings, pricing, and advertising to most effectively position versus competitors in the areas of education, entertainment, and arts and leisure activities. ï Assist with other organization-related projects as needed. Work creatively within marketing budget. Stay current in emerging trends and best practices in marketing, marketing communications, social media, and content management. ï Generate and post multi-day content each week for Social Media sites (e.g. Facebook, Twitter, Instagram, Pinterest) that results in increased community engagement and page views as demonstrated through social media and website analytics. Maintain the branded voice of NCSL on social media accounts. Aid in the development and maintenance of NCSL’s website, including updating photography seasonally or as needed to support programs, ensuring fresh content, maintaining events calendar, and creating forms as needed through a WordPress platform. Attend and work at Nature Center signature events as determined by supervisor. ï BA degree in marketing, communications, journalism or similar. ï 1-3 years of hands-on experience in for-profit or nonprofit marketing and communications. ï Excellent written, oral and interpersonal communication skills. ï High level of integrity and professionalism. ï Ability to think creatively and strategically, multi-task, meet deadlines, pay attention to detail and follow-through. ï Ability to excel in a highly-collaborative environment as well as independently. ï Proven ability to manage projects requiring multi-disciplinary input and to meet deadlines. ï Excellent organizational skills and attention to detail. ï Proficiency with Microsoft Office, specifically Word, Excel, and PowerPoint. ï Proven experience with Constant Contact or similar program establishing email content distribution program growth. ï Demonstrated proficiency with WordPress, including responsive web design and plug-ins, together with basic HTML knowledge. Familiarity with Google business tools, including a working knowledge of Google Analytics and Google Ads is a plus. ï Basic familiarity with design software, including Illustrator, InDesign and Photoshop. Demonstrated proficiency with using analytics to manage and grow online social networks (Facebook, Twitter, Instagram, and Pinterest, as well as scheduling software such as Hootsuite). Commitment to the Nature Center mission, principles and values. Start Date: January 2018, or as soon as possible. DEADLINE: Friday, December 21, 2018, or until filled. committed to diversity at all levels.